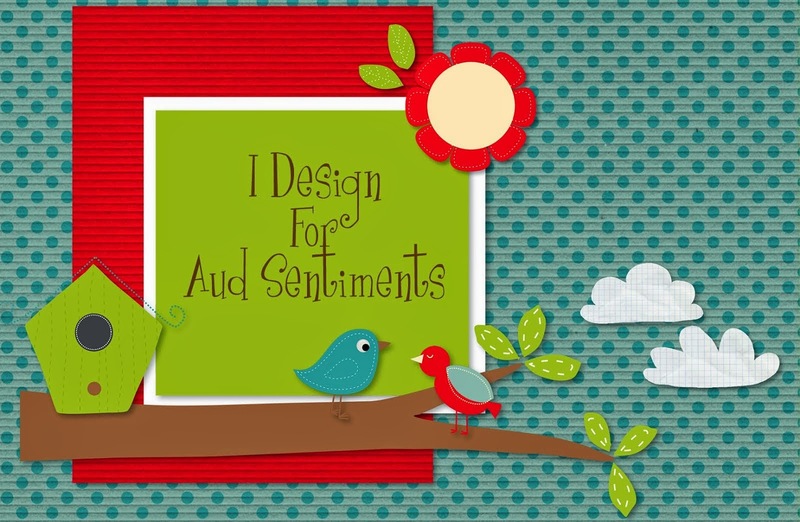 For mine, I used "Decorations" as my image and "Happy Holly Days" for my sentiment. I colored with my ProMarkers and a red Copic marker for his hat and the berries. I also added tiny dots of glitter to the berries in the sentiment, though it's nearly impossible to see in the photo. I applied Wink of Stella to the white reflection spots on the Christmas decoration. I love the traditional red and green for Christmas but must admit that green is my more favored of those colors. 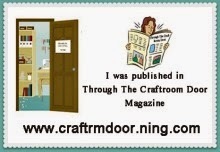 I die cut the image (Gina Marie) and also die cut a circle (QuicKutz) which I dry embossed with my "Linen" folder. 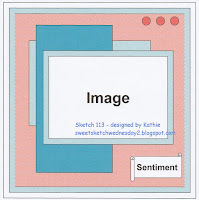 I cut the sentiment and its mat with other QuicKutz dies from the same set. The plaid ribbon was 'rescued' from one of last year's packages (waste not, want not) and I still have a strip of it long enough to make another bow for later this year. I find that I usually wrap my ribbon around the card front so that the cards look 'gift wrapped' with the ribbon saying "I'm finished!" I also love how ribbon lets me tie in colors I've used in the image or papers. Sometimes I take plain white ribbon and 'dye' it with markers to get the exact shade I want. Other than that ribbon and bow, I left this card pretty CAS because I'm sure it'll get sent to one of the many guys in my family. They outnumber the gals almost 2:1. I hate to admit how long it's been since I used a Whoopsi Daisy image but I'm making up for it. In the last week, I've colored three WD images and will be sharing them with you over the next couple of weeks. 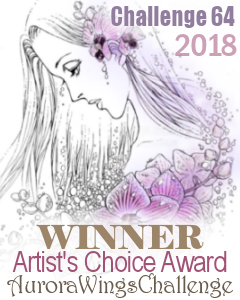 As I looked at this image before coloring it, I could just see my granddaughter pulling her hair back in either braids or pony tails and looking like summer sunshine. :-D So, out came the yellows and summer-y coral pink ProMarkers for coloring the image. 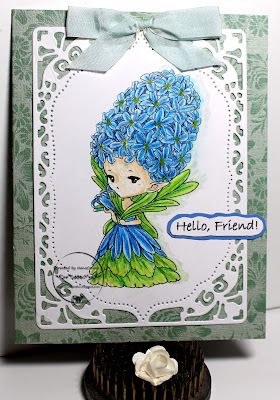 After she was colored, I did an out-of-the-box technique, cutting her with a simple scalloped die from Spellbinders, and I inked the edges all the way around. I cut the matting oval with a die from another Spellbinders set but I ran that CS through my Linen embossing folder before I cut it. I added the sentiment on top of the image, then layered everything onto striped dp (DCWV) and found the gingham ribbon and fabric flower, which I knew would be prefect embellies. I put all of that onto the pale, pinky-beige, card front and called it finished. I absolutely adore all the little flower sprites at AuroraWings and I bought a few more a couple of weeks ago, this being one of them. Isn't she sweet? 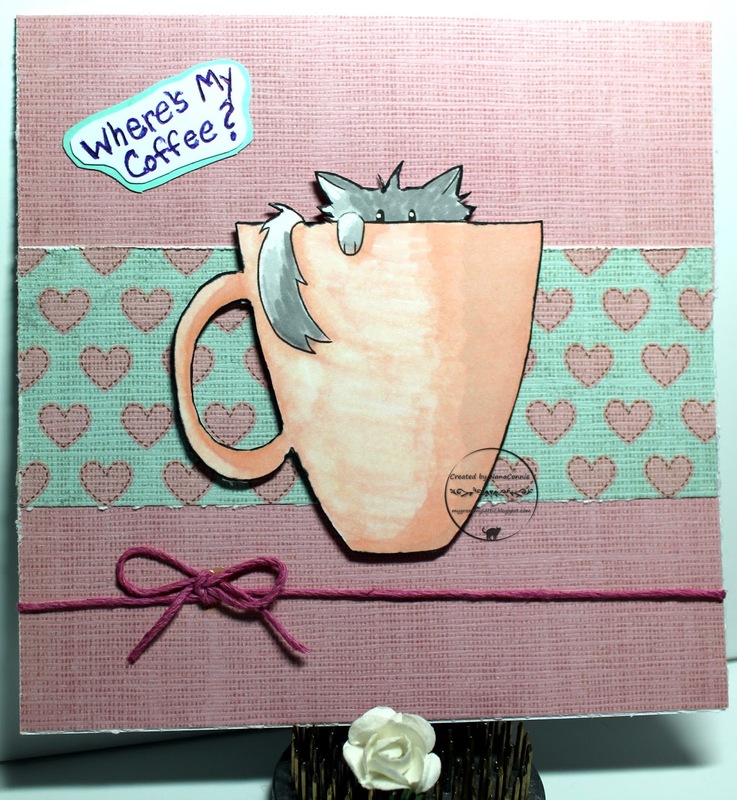 I hand tied the bow, then printed the sentiment, matted it, and added it on top of all the layers. I have new neighbors moving in down the street and did a card to welcome them to the neighborhood. 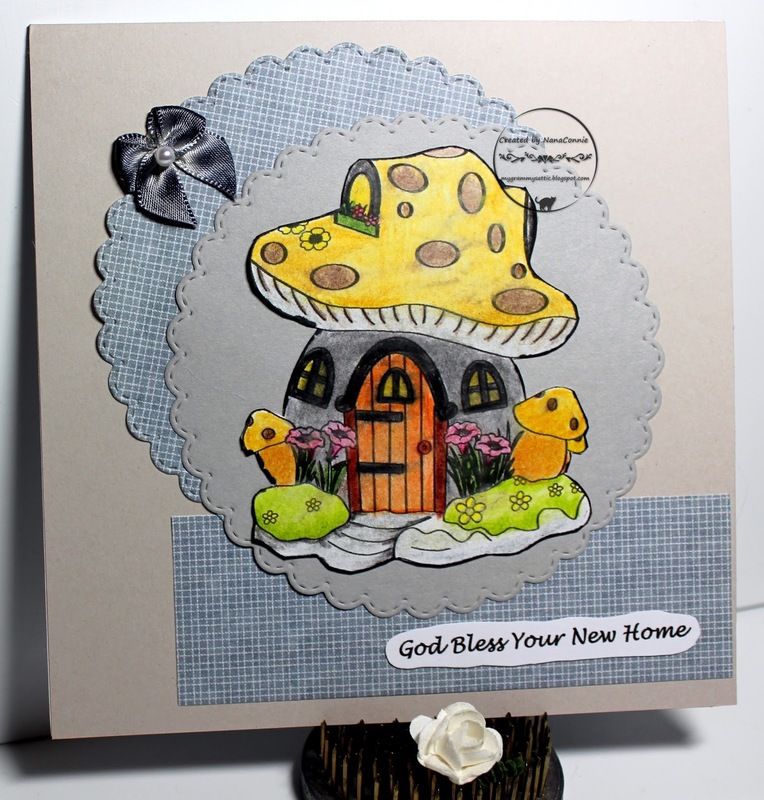 This sweet, little, mushroom-fairy-house is from Sasayaki Glitter. I colored this one with my Lyra polychromos pencils (practice, practice, practice!) and cut it with a stitched scalloped circle die from Memory Box. I cut another circle with the same die and off set it behind the image. I had a small scrap of that dp left after the circle was cut so I added it below the circles. The only embellishment I added was the pewter gray bow with the pearl. My second post this morning. Be sure to scroll down for the first one. This sweet image from Sami Stamps is perfect for the Summer Coffee Lovers Blog Hop. Although I prefer my coffee iced in the summer months, this little feline would settle for any kind of coffee at this point! The image is colored with ProMarkers, then fussy cut. Although it doesn't show up very well, the lightest part of the coffee mug is covered with Wink of Stella for some shine. I tied twine around the card front and left it CAS. Adding to my collection of birthday cards, although this one will be going out fairly soon for a summer birthday. The image from Lemon Shortbread was so much fun to color and made me think of summer so I used summer-y colors! One of the 'fun' summer things I get to do is tend my roses, and make lots of rose bouquets for the breakfast bar and dining table. 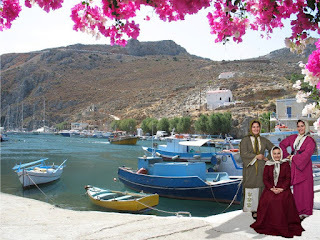 For me, roses mean summer every bit as much as trip to the seashore. I colored with my ProMarkers, then cut the image with a die from one of my sets by Spellbinders. I layered the die cut onto a coral pink card front and added one of my little hand-made bows, dyed with a ProMarker to get the exact color I wanted. The die cut was so detailed and feminine that the card really didn't need any other embellishment so I opted for leaving it rather simple. 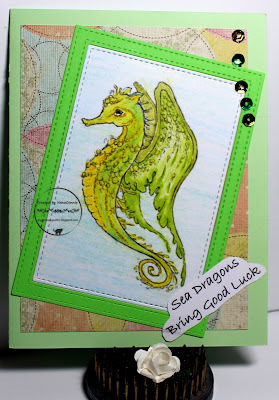 I love sea dragons - I think they are the most elegant and dramatic of all the seahorses. When I spotted this one from AuroraWings, I grabbed it and have used it several times as an iconic image for summer cards. Nothing could be more indicative of a relaxing summer day than a sea dragon drifting with the waves. I'm practicing again with my polychromos pencils, trying for deeper, richer colors. 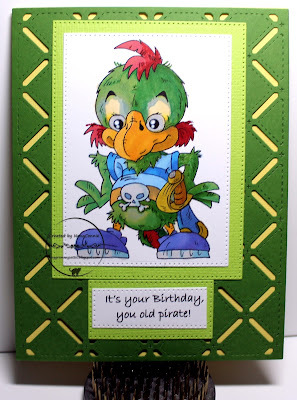 Once colored, I cut the image (and the green frame) with inside/outside stitched rectangle dies from Die-namics. The image is inlaid into the frame. I think I'll have two posts again tomorrow; one for sure and maybe two if I get the second card done on time. I'm not that far away from being gone to the California beaches for a few days and am trying to get everything prepared for my absence, including a few card which need to be posted before the month runs out, hence the double posts on a few days this week. Time for another Christmas card. I'm not yet caught up on my promise to myself to do one card per week between January and August, then 2 or more from September to Christmas, but that's because I simply did none at all in January, February and March. So much for promises to self. lol But once I started in, I've been pretty consistent and have made several to make up for the missing 12 weeks. 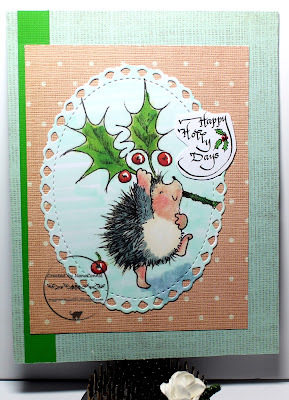 This darling little hedgie (Penny Black), prancing about with the holly branch, dropping berries everywhere, in sheer love of the season, is a favorite stamp of mine and perfect for a sweet but simple Christmas card. I wanted to be able to use it for one of the many men/boys in my family so I held back on the embellies. 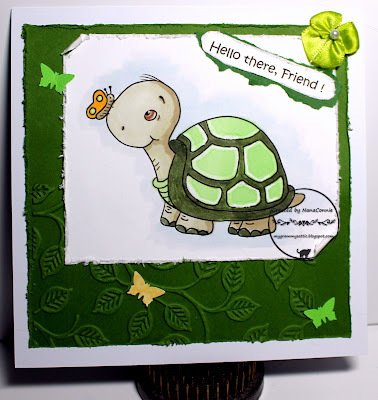 The image is colored with ProMarkers and gel inks, then the oval is cut with an Unbranded die. 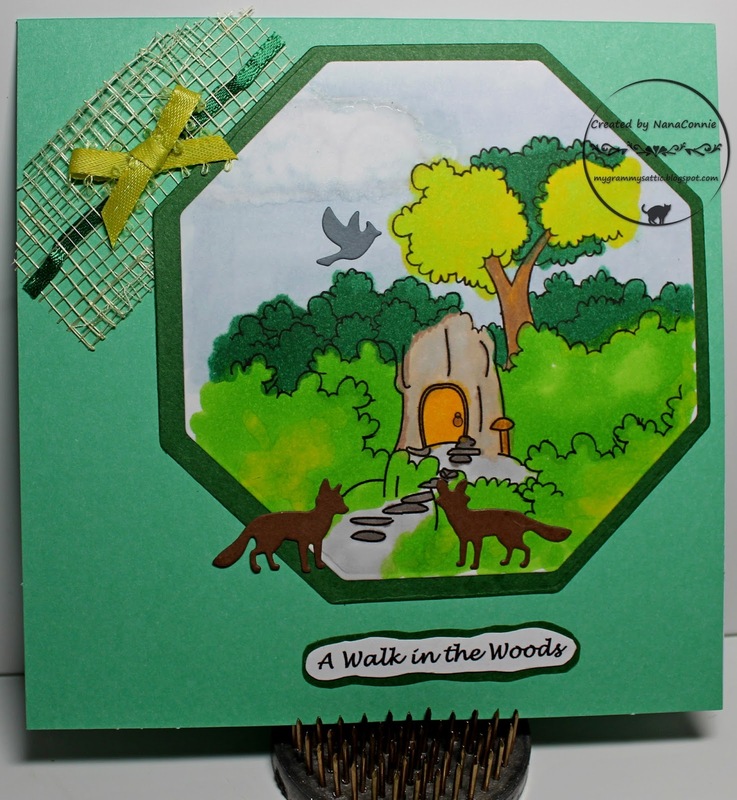 Both the papers are from the scrap basket and the green ribbon is also a tail-end left over. The sentiment is from QKR Stampede and it's cut by hand. I wanted to do a summery card in cool colors to make my mind think that our temperatures were well below the 110 degree mark. I chose this image from Ching-Chou Kuik and colored it all in blues and purples. You know butterflies wouldn't be out in heat that high, right? I used my ProMarkers to color her and the butterflies, then cut her with a die from Spellbinders. I backed the die cut with medium blue paper and mounted it onto a light blue card front. I printed and hand cut the sentiment, then added a dimensional butterfly. 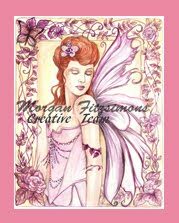 The die cut was so delicate and complex, that I decided the butterfly was the only embellishment needed but I did add glitter to her wings. You can't hide your birthday or your age any more - the cat is out of the bag! 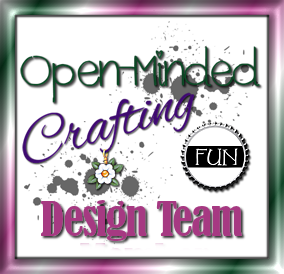 And a new challenge starts today at QKR Stampede, where our "Always Anything Goes" theme is on tap but we also have the optional twist of "Paper Piecing," if you want to use it. The image I used is "Cat in Bag" and the sentiment is "Cat is Out." His favorite color is golden yellow (not the namby-pamby, pastel yellows that barely whisper their name) so, of course, that was the first color I chose. I found some rich yellow dp in my scrap booking stash and used it not only for the background but also to paper piece the bag. 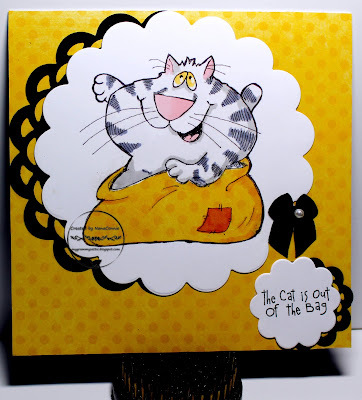 After coloring that sassy cat with ProMarkers, and adding the paper pieced bag, I used a Spellbinders die to cut the image. The black die cut was done with another die from that same set, as was the sentiment and black die cut offset behind it. The tiny black bow was the only embellishment needed. I love my collection of Rick St. Dennis images which is still growing and, while I've used thisone several times, it looks different each time I use it. This time, I did a bit of Christmas red, some icy winter blue and gray, and some metal snowflakes and ornaments. What do you think? 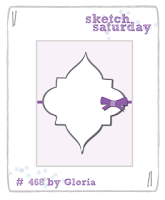 I based my card on the sketch at Sketch Saturday. I colored with ProMarkers and cut it with a die from QuicKutz. I printed the sentiment and added it to the bottom of the image. I put two long, silver-metal, ornaments over the tiny round ones which had been on the dp, then added a metal snowflake charm to the image. I think he's adorable - and definitely loveable! 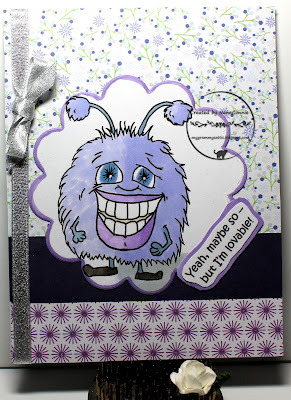 I used my ProMarkers to color him and cut him out with a die from Spellbinders. I inked the outer edges of the die cut to make a "frame" and layered it onto three different papers, all scraps from my basket of leftovers. I know the middle strip looks almost black but it's actually deep purple with a slight pattern in it. Blame the photographer! The bottom strip is embossed and glittered. I added the metallic, silver ribbon and called it finished. I'm hoping the weather where you are is considerably cooler than what we have out here on the West Coast of the US. We have an incredible, high-pressure system just plunked down on top of us and we have already broken high heat records two days in a row. One of those records went back to 1946 and we broke it by 2 degrees. The weather folks say temps of 107 to 114 are very likely to last another 10 to 12 days. Can you believe they were looking at the 7 day forecast and said that on Saturday we might get a "cool down" to 101 degrees? You can imagine what the temperatures are like before Saturday comes around! 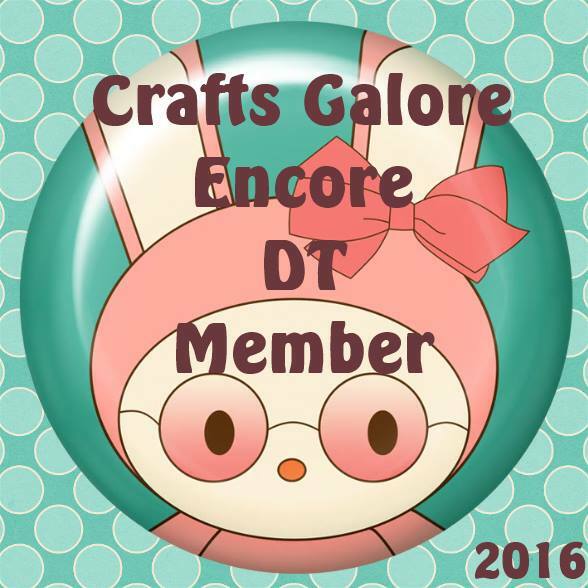 A new challenge starts today and it's also my last card as a member of Ike'sworld DT. I have loved working with Ike and the team but I'm going to be so busy this summer, including travels away from home and even away from the internet, that I simply had to cut some of the DTs on which I serve, and Ike's was one of them. Can you believe I was on 6 different teams? Yikes! For the remaining teams, I'm working madly to pre-schedule posts. Anyway, at Ike'sworld this fortnight, we have our usual "Anything Goes" theme but our optional twist is "Blue Christmas (in July)" and you can do anything Christmas if you want to use the twist. I found this fun and funny "Bah Humbug Bulldog" in Ike's store and decided to do him in non-traditional blues instead of red for his Santa suit and hat. Don't you just love the expression on his face? I used my ProMarkers to color him, then die cut him with a stitched circle die from Die-namics. The dark blue frame is cut with a die from QuicKutz. I added dp from an old DCWV Winter stack and found the sparkly snowflake borders in my Christmas stash. No telling how old those are but they still sparkle brightly even though it doesn't show much in the photo. They're also 3D so it gives some great dimension to the card. I have a dear friend who is always doing something wonderful and unexpected for others, including me. I'm not sure I really show my appreciation often enough so I've done this card to say "Thank You." 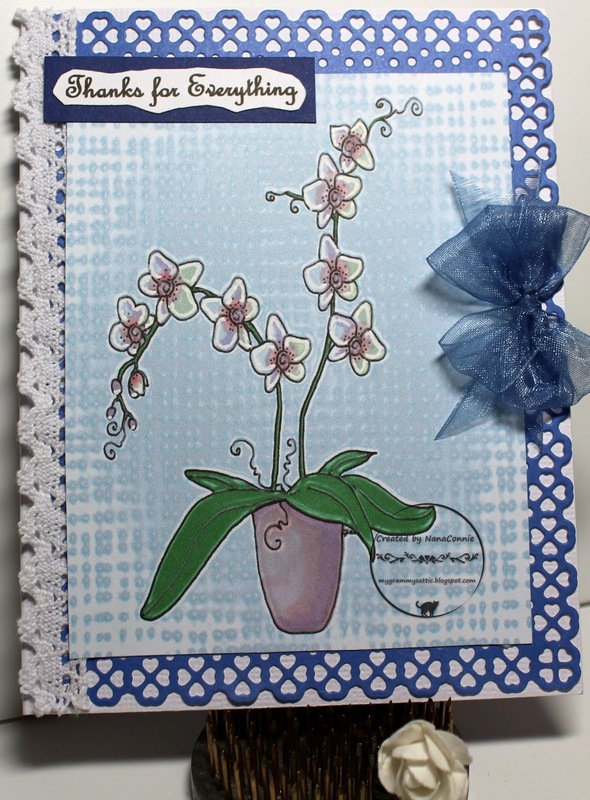 She adores orchids, grows them rather well in her greenhouse, and I thought this image from Tiddly Inks would be perfect for her. This one took a bit of imagination because I created the background on a blank page working with one of the Picture Format options in Word. However, I didn't have a .png version of the image so I couldn't merge it onto the background before printing. Instead, I printed the background, put that sheet of paper back into the printer, and then printed the orchid image onto it. 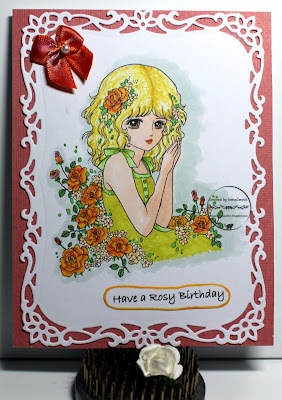 I colored it with ProMarkers and gel inks, then cut the background into a rectangle the size I wanted for this card. The blue frame was cut with an Gina Marie die and I added a scrap of lace to one side of it, then layered on the image and the matted sentiment. The final touch was to 'dye' two, sheer ribbon bows (using ProMarkers) and add them as the embellishments. Have you ever glanced at an image and just had to giggle out loud? 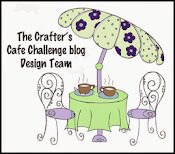 That's how this one from Create with TLC struck me and I had to use it right away. I printed the image twice, colored both of them with my ProMarkers, and glued one of them to two layers of white CS. 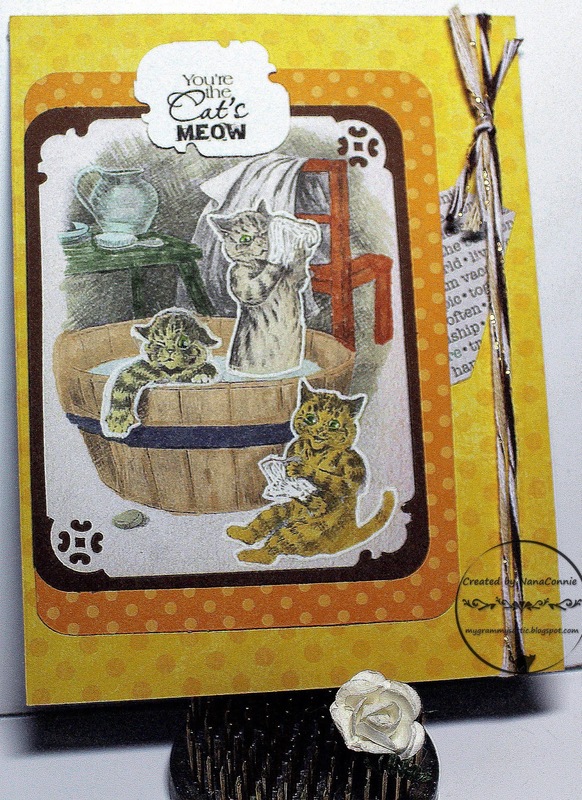 Then I fussy cut the cats from the one with three layers and glued the cats onto the first image. This gave some great texture without the kind of open dimension I would have gotten using pop dots or foam tape. 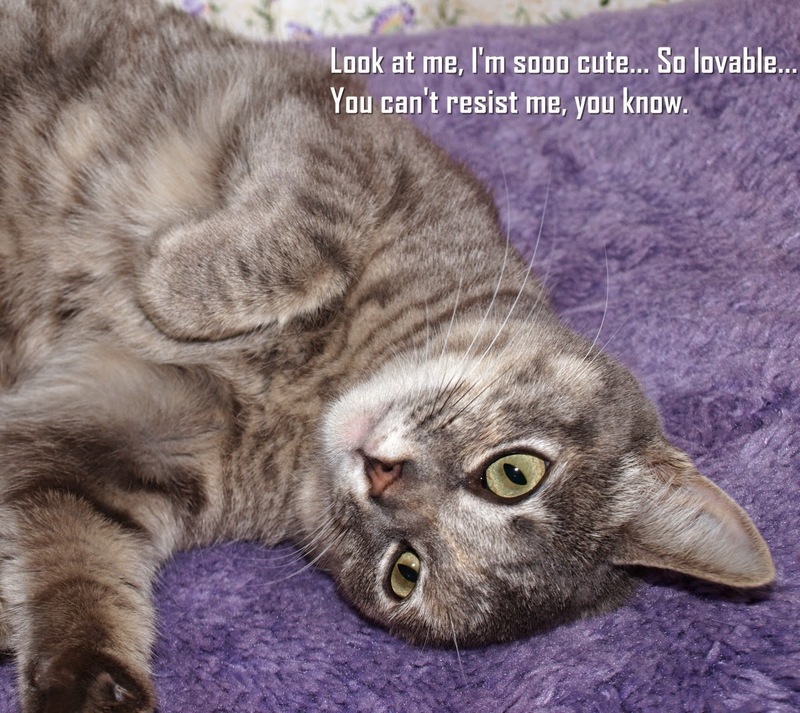 The white border I left around the cats when cutting makes them pop off the background. 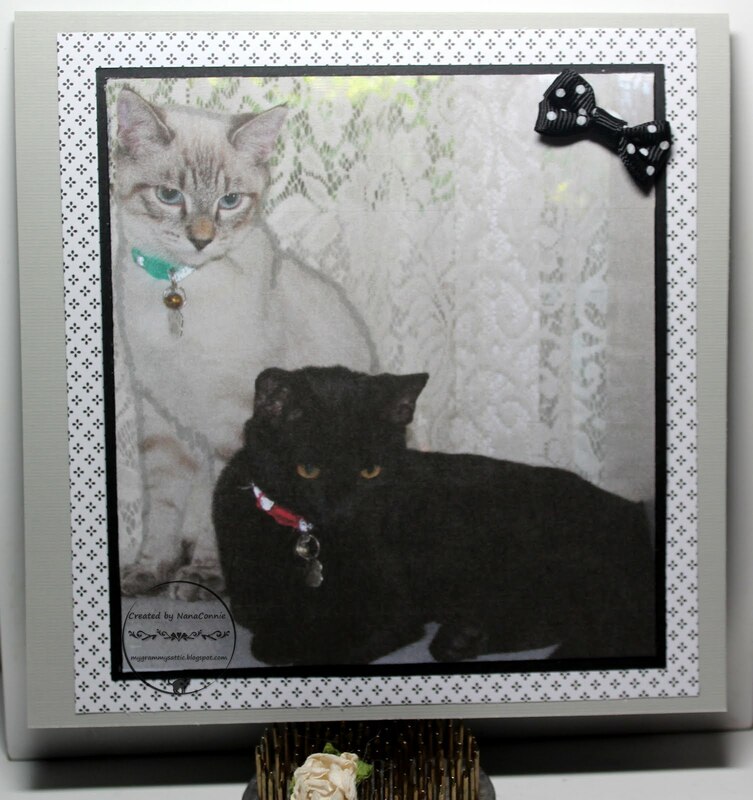 I used a punch (Fiskars) on the corners of the image, then matted it with a die cut, rounded rectangle (Spellbinders), and a second, larger frame cut out of dp with the next larger size of die. Those were mounted onto a second dp with a scrap of text dp added to one side. I finished it with metallic twine and the sentiment, which was also corner punched. 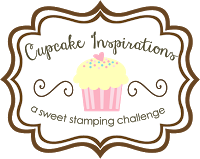 It's Friday again and we have a new, weekly, challenge starting at QKR Stampede. 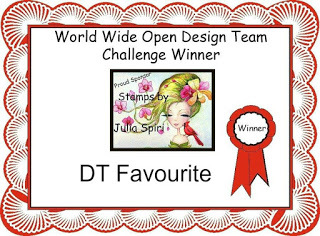 As usual, we have our "Anything Goes" theme but we also have our optional twist - the theme of "Quilting or Stitching." I did my best to accomplish both on this one card. I used the QKR image "All Tucked In" and I think it's totally adorable! 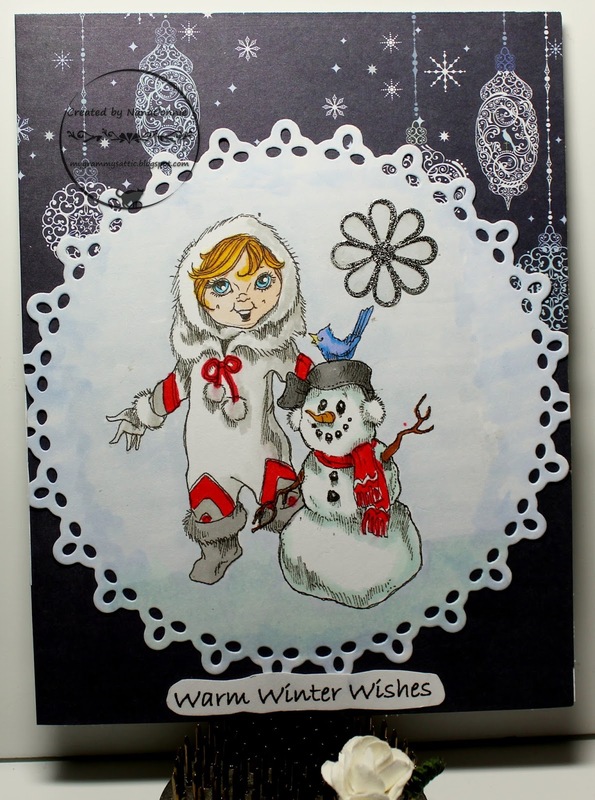 I colored the image with my ProMarkers, then cut it with a die from an unbranded die maker. The polka dot frame for the image is also cut with another die from that same set. I cut the denim and yellow papers for background "quilt" with a chain stitched die from Gina Marie Dies. The sentiment is printed and matted with blue and yellow layers. 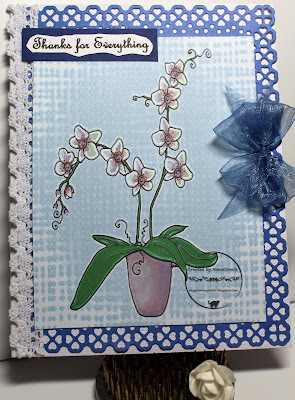 I decided not to add any embellishments because I wanted the quilt background to showcase the image. I felt that anything added on top of it would take away from that effect. The best place to be on a hot summer day is walking through the shade of the woods. We had a mild weekend but our temperatures are rising rapidly and we're in for some really hot ones so this image from the progressive challenge over at Dragon's Lair was a perfect way to think cool. For this one, I got out my tray of watercolor paints and a couple of brushes, then colored the entire thing in watercolor. I managed the cloud by swirling water on the already painted and dry sky, then let it dry. That lifted out some of the sky color and created some fabulous shadows in the cloud. I cut the image and the frame with dies from QuicKutz. Everything else was done with scraps which were already on my desk; paper, ribbon, mesh, sentiment and mat for it.. The foxes and the bird are tiny die cuts (Memory Box and Die-namics) which were double layered before gluing them to the image piece. I added a bit of ribbon and some mesh, then tied a bow of a lighter green scrap of ribbon. I have four masculine birthdays in my family that fall in June and July, and another one in August so I'm adding to my supply of birthday cards for guys. 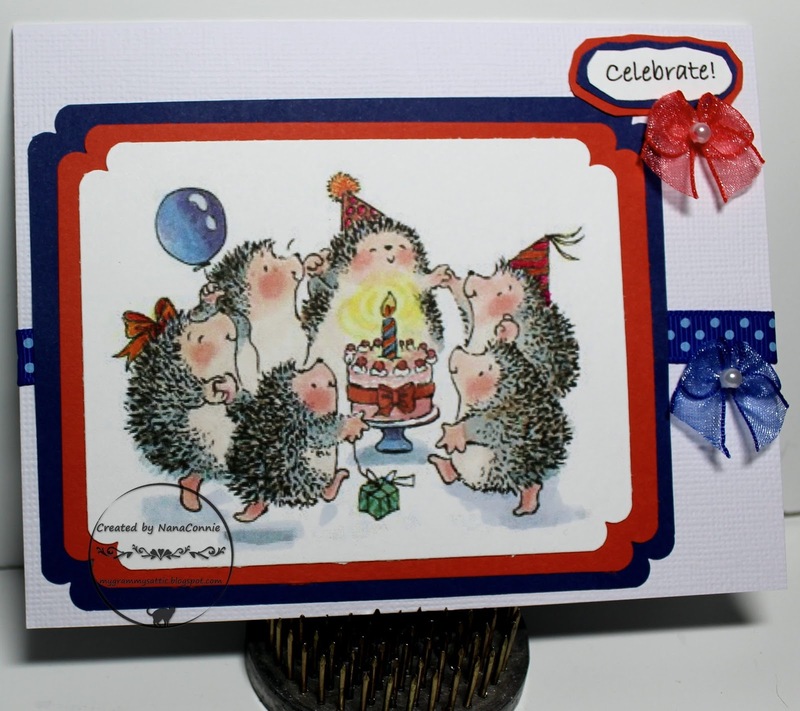 This one, with a Penny Black stamp (it's always a toss up for me whether I love the mice the best or the hedgies! ), seemed a natural for a birthday that always rolls around during the hottest weather. I used my ProMarkers (and a blender) to color those sweet mice (clearly my favorites this week! 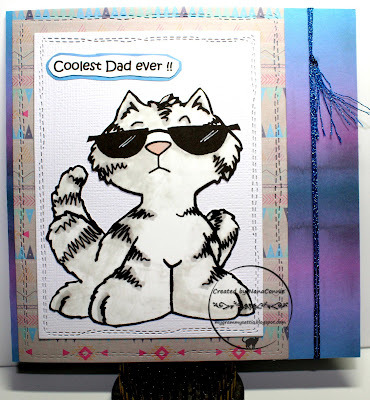 ), then cut the image with a die from Spellbinders. The die is actually one of their lattice frames but I used it to cut the image as the center piece and saved the actual frame for another project. I layered the image onto dark blue CS, and put that whole thing onto sky blue CS. After adding the two scraps of satin ribbon, I put the light blue onto a medium gray CS and that went onto the card front. Because this is a guy card, the only embellishment I added were the two scraps of baker's twine which I tied into a bow around the two ribbons. The sentiment was computer printed and matted before adding it to the front. The white flower is not part of the card; it's only there for visual dimension in the photo. 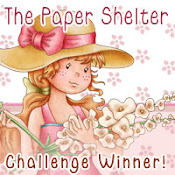 Another progressive challenge card, this time using a sweet image from Gerda Steiner. 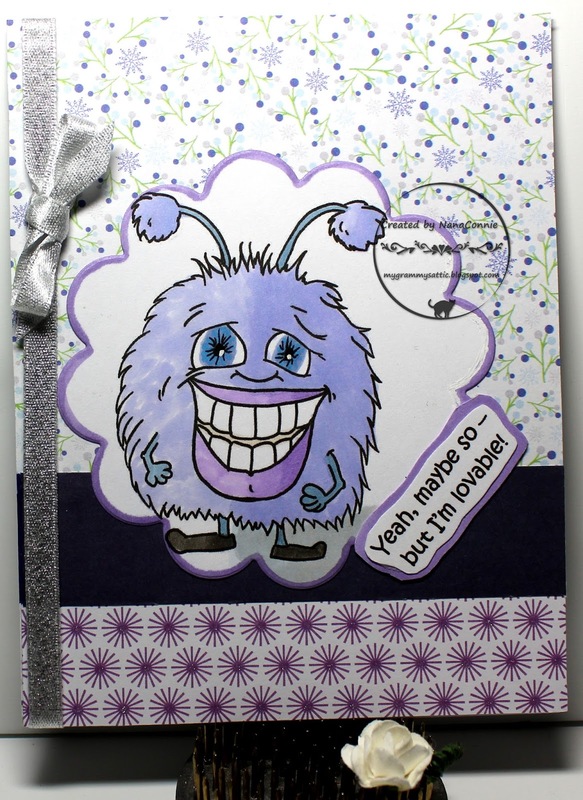 I love friendship cards or those done and sent for no particular reason at all. This is one which won't stay in my stash very long. Not only does this card have lots of distressing, it's put together completely from left over scraps. Even the image was printed onto a half sheet of white CS which was left behind from printing a single image onto a full 8 1/2 X 11 sheet. 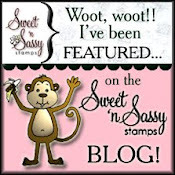 The image came from Beccy's Place and I just adore the expression on his face! I colored him with chalks and added shading with my ProMarkers. I cut the image and the green mat with an inside/outside stitched die from Die-namics, and then cut the background CS with that same die so that the image was inlaid into the background except for the place where the scrap of polka dot dp was applied. A second post today for no particular reason except that I woke somewhat early, felt a bit creative, and got this card made after an hour of detailed coloring. 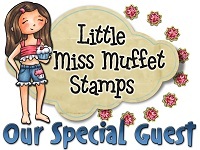 I haven't used any of my Magnolia stamps in a very long time so I thought it was time to dig them out. 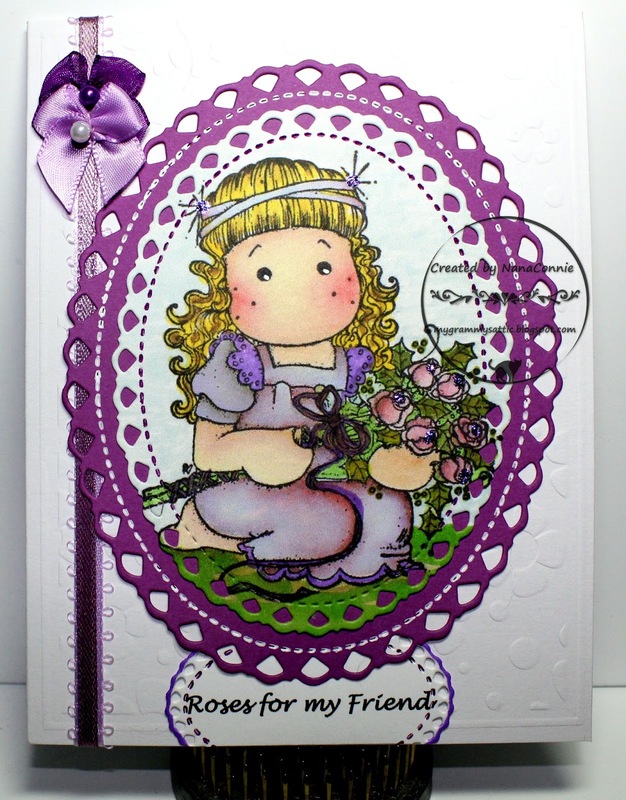 This sweet Tilda with the bouquet of roses just seemed perfect for a friendship card. I colored her with my ProMarkers and added a touch of glitter to the sparkle points in her hair and to the center of each rose in the bouquet. Unfortunately, as with most of my photos, the sparkle just doesn't show. But it's definitely there IRL. The card front is embossed with one of my folders. Both the image and the purple mat were cut with Unbranded dies. I used gel ink to highlight the stitching on each die cut. 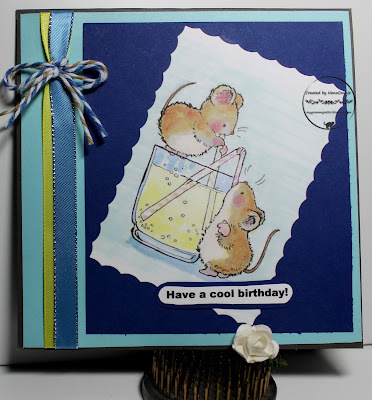 The sentiment was printed and die cut, adhered to the bottom of the card front and then trimmed along the bottom. I used bits of two different ribbons layered on top of each other and then used two of the bows I make by the dozens and toss into my stash for future use. This time, I used white bows (one satin & one sheer) then 'dyed' each bow with ProMarkers to get the color I wanted. 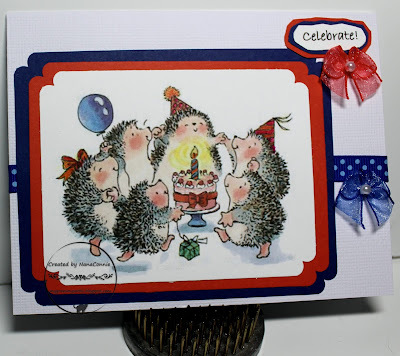 Today's card is for yet another of my favorite progressive challenges; this one at the Sasayaki Glitter FB challenge. 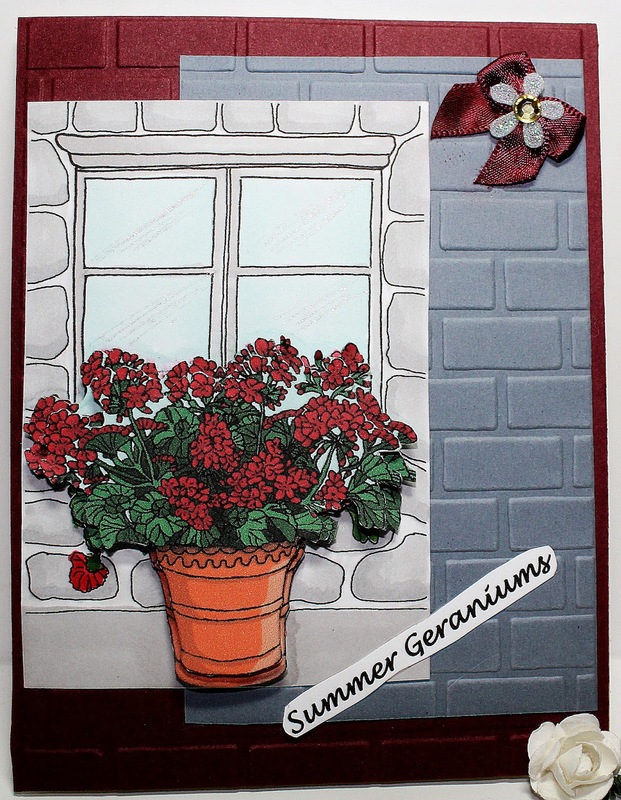 I used lots of gray on it so that I could enter it into their blog challenge also. What could be cuter than chameleons dancing on a summer beach 'til the sun comes up? and this is their last challenge. 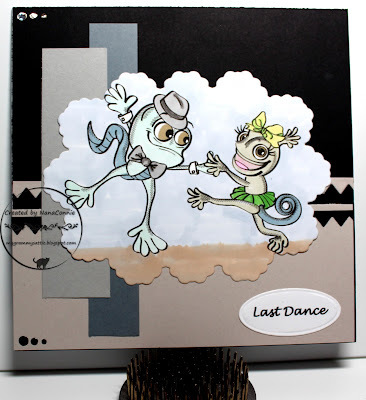 Those cute dancing lizards are colored with ProMarkers, then cut with a die from Sue Wilson. 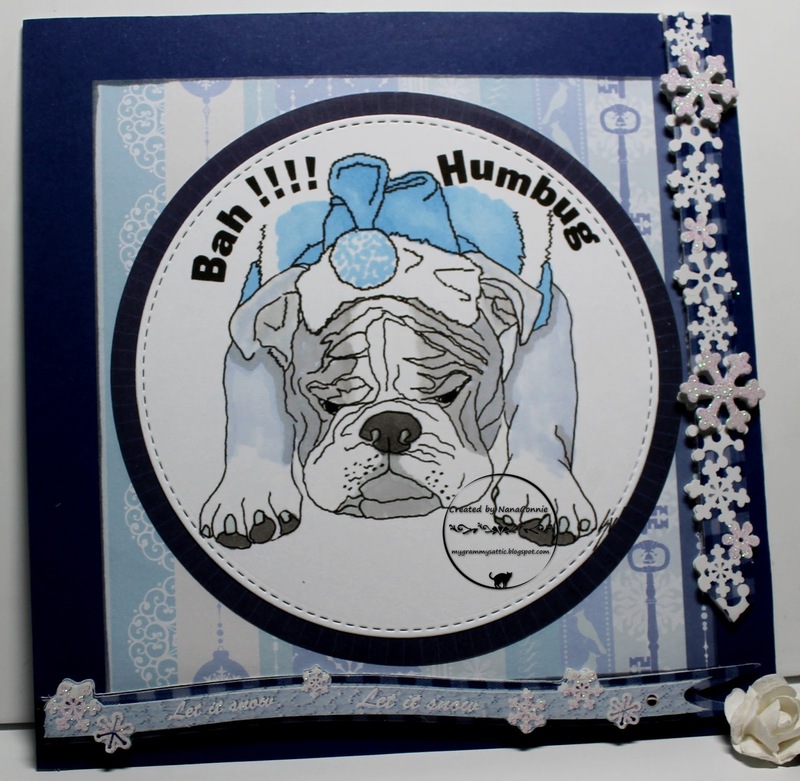 The zig zag pattern across the middle of the card was cut with a die from CCC Designs. I added sparkly rhinestones to both the top and bottom corners but left it rather plain after that since, once again, this is a card which has to be mailed. 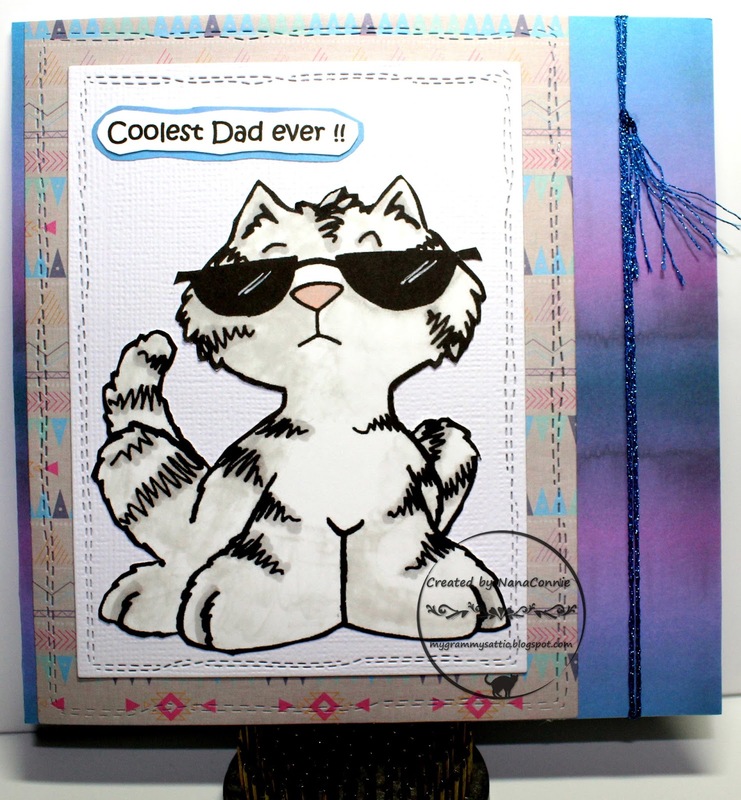 I think this "cool cat" from Eureka Stamps is the funniest thing ever! I decided it was perfect for another Father's Day card. My own dad having been gone for many years, I now make them for family members who are dads. 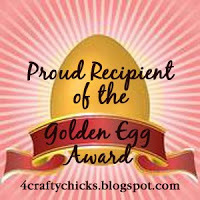 :-D This one will go to my #1 grandson. Because it's going to be mailed, I kept it as simple as I could. I colored the image with my ProMarkers, added white gel ink as reflection on the sunglasses, and fussy cut it by hand. That was time consuming and detailed but it's a technique I love to do every now and then. I matted it with an embossed frame ("Linen" folder) of white CS which had been die cut it with a stitched die. Both the multi-colored frame (cut with a die from a CUTplorations set) and the background paper are from a Recollections stack. 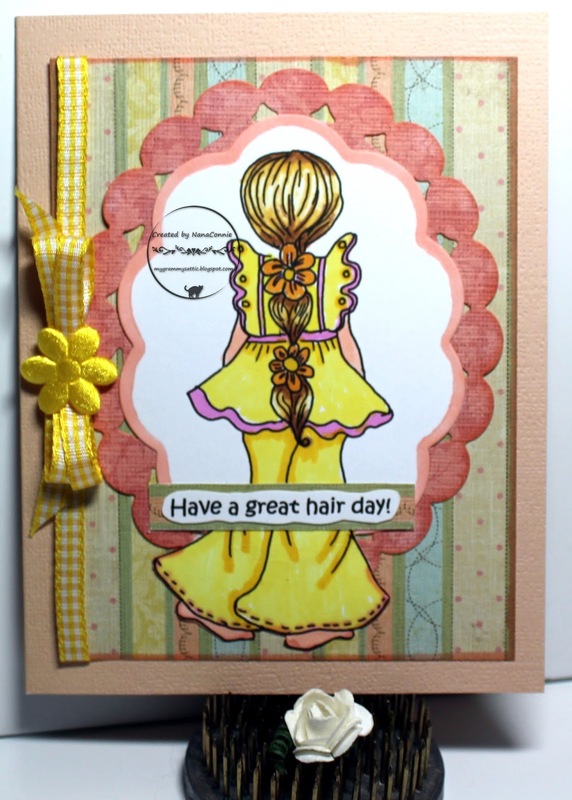 I added sparkly twine, tied into a knot and with the ends feathered, as a salute to embellishment. It's Friday and, as you know, that means a new challenge over at QKR Stampede. We always have our "Anything Goes" theme but each week we offer you an optional theme if you choose to use it. This week our optional theme is "For the Guys." I always hear the old expression that Baseball is "America's Sport" but have never really understood why. Basketball is the most watched on television and football (the kind we play here in the US, not soccer) is the most attended in person. So how does baseball rank as America's Sport? 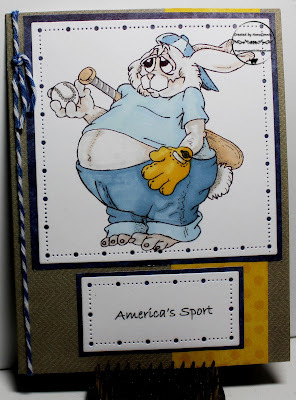 However it got that way, my grandson plays baseball and loves it so having this card on hand for him seemed a natural. I used the QKR image "Baseball Bunny." I used a pretty simple design but also did lots of layers. I started by coloring the image with my ProMarkers then cut it with a Gina Marie die. 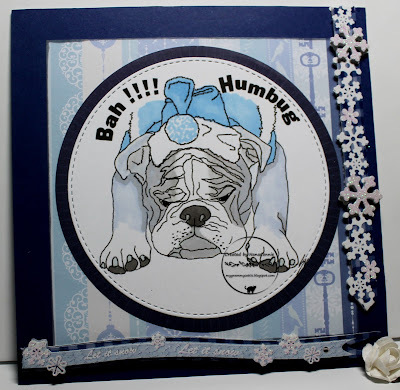 The sentiment was also done on smaller die cut piece using a die from that same set. I matted each of those pieces with navy blue dp from the scrap stash. 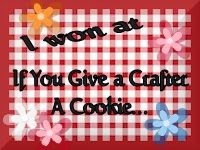 I found two more scraps of dp and used them for the background, then layered on the image and sentiment. Finally, I found some blue baker's twine, wrapped it around the card front and tied a square knot, then trimmed the tails fairly short. A fun, masculine design. I'm going all out with Fabrika Fantasy and adding to my masculine birthday card stash at the same time. I absolutely adore this Parrot Pirate image. He's just too fun and funny! 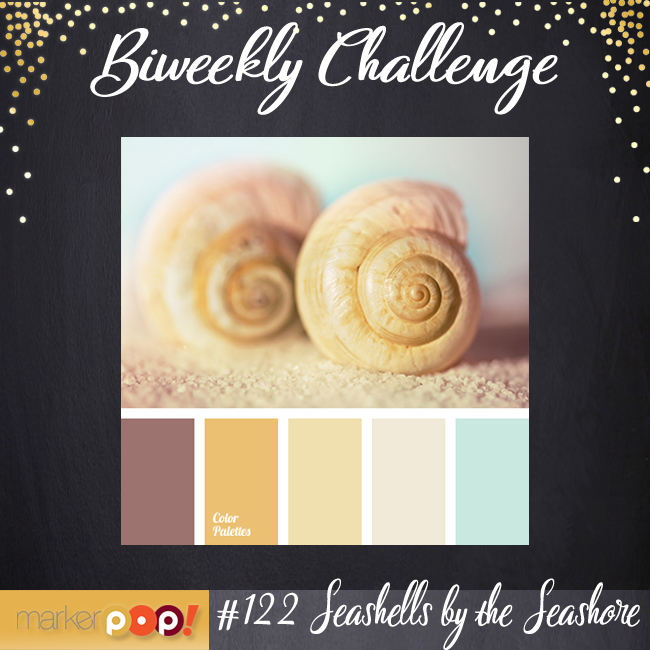 Tuesday Color challenge at The Outlawz. OK, so that silly parrot isn't as elegant as a peacock but I colored him in peacock colors with my ProMarkers, then die cut both the image and the light green frame with a pierced rectangle die from Memory Box. I die cut the sentiment the same way. The lattice background is cut with another Memory Box die and I backed it with yellow CS. Because of all the die cuts, it looks like a rather fancy card design, but it's really very simple - 4 layers, 3 of them cut with dies. 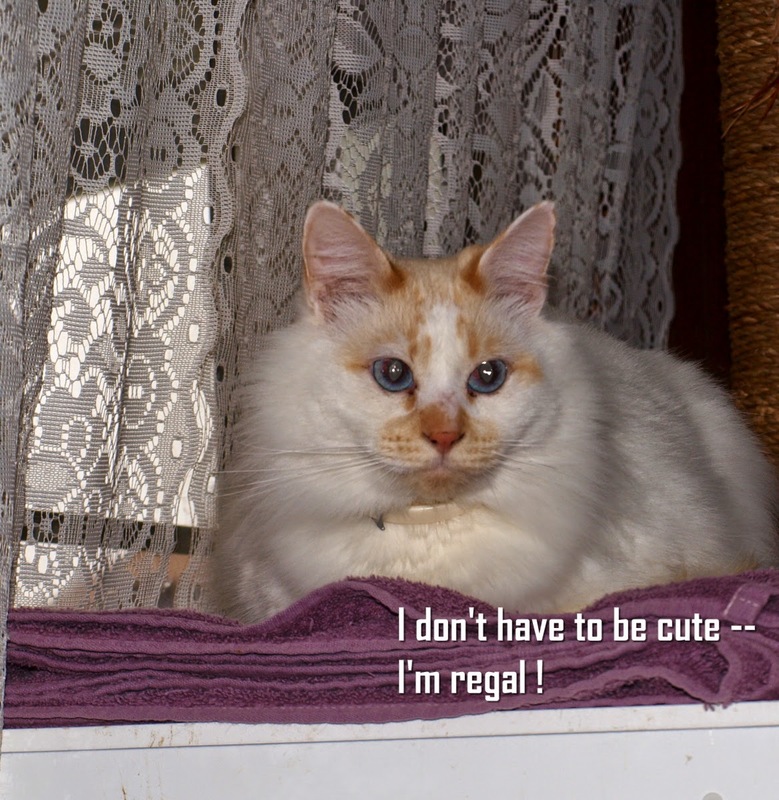 A really quick post this morning because I'm leaving here very early, will be gone most of the day (much to the dismay of my own two feline fur babies!) and must get this posted. 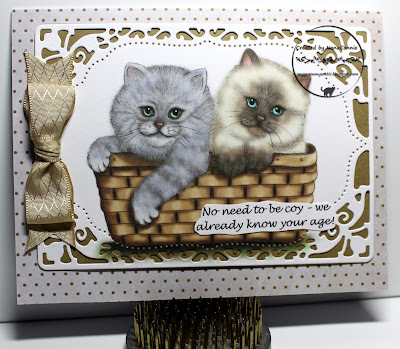 I'm adding yet another birthday card to my stash and, because I didn't really have anyone specific in mind when I was making it, it's done in monochromatic neutrals. 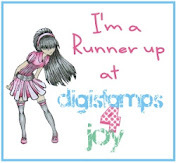 This is an old stamp from CDS, no longer available because they're no longer in business. But it is a sweet image and worth using over and over. The die cut frame was done with an Unbranded die. I backed it with a scrap of tan CS. The polka dot paper came from a stack by Recollections and was a scrap on my table with a hole in it from another die cut I had done but since the hole was going to be covered with the kittens, that didn't matter. Nobody can tell it isn't a full piece of paper. The bow (ribbon from Really Reasonable Ribbon) is hand-tied with the help of my bow maker. The sentiment is printed, hand cut, and applied over the image. For years, my SIL said, "No!" to all requests from the kids about adding a dog to the family. After a few years, he amended that to, "If we ever have a dog, it'll be a working dog for bird hunting or retrieving." 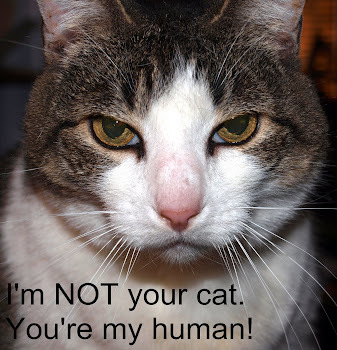 Finally, about 3 years ago, he brought home a darling Brittany Spaniel puppy and and she was named Samantha. Not Sam or Sammi or any version of a nickname -- she was to be "Samantha" and he started with her training immediately. 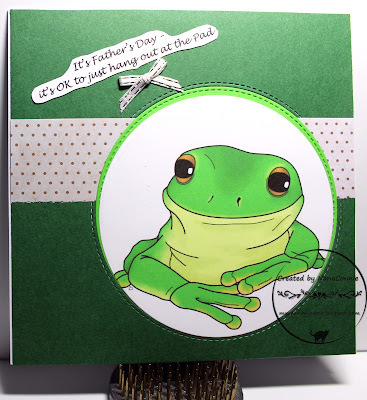 So, this card is for my SIL on Father's Day. 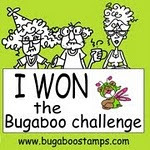 The image (from Bugaboo) is a perfect representation of Sammi's reality. :-D She does love her "Papa" but let's face it, she's a pet! 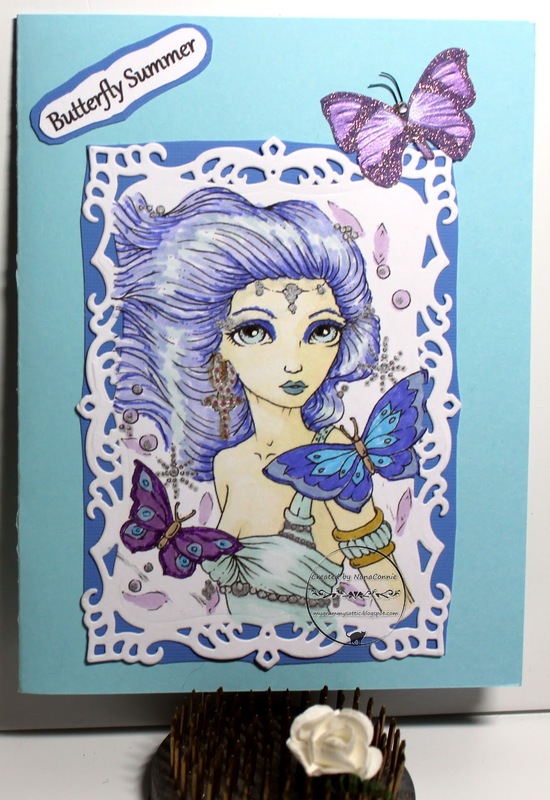 I colored with a combination of Shin Han Touch Twin and Copic markers, then die cut the image with a simple rectangle die from Spellbinders. I rounded the corners and distressed all the edges, then mounted it onto a die cut diamond (also Spellbinders) from which I trimmed and rounded two of the corners, distressing the edges of that piece, too. 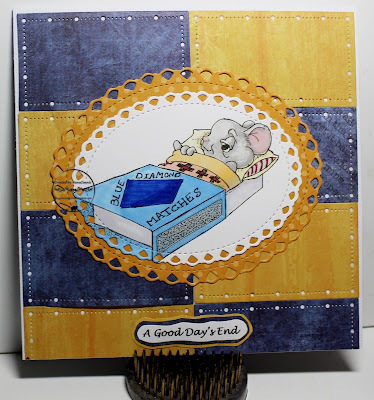 I used scraps of dp from one of my Recollections stacks for the background and the strips, including the brown mats behind each of the strips. Again, I distressed the edges of everything. Before layering on the image piece, I used a bit of string which I had dyed that color with a Copic marker, and tied it with a simple square knot.